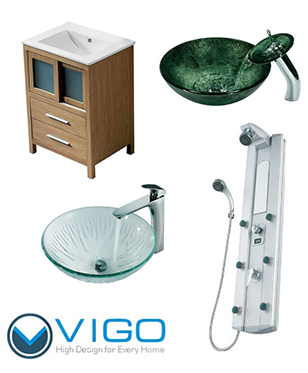 Vigo can add style and luxury to your bathroom with their line of vanities, shower panels and elegant glass sinks. Beautifully constructed and thoughtfully designed, these pieces make a statement in any bathroom. Vanities - Modern vanities, sleek ceramic sinks and matching mirrors. Both freestanding and wall mounted models all with deep storage. Shower Panels - Enjoy massaging jets for a whole new level of relaxation. Constructed from solid stainless steel designed to be lightweight, durable and corrosion resistant. Elegant Glass Sinks - Handmade vessel sinks come in a wide variety of colors and designs. Many come with matching faucets or unique, dramatic waterfall faucets. Check out our Bathroom page to learn more.